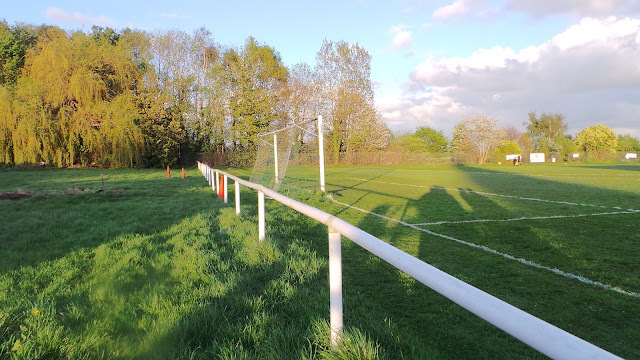 The club was formed in 1926 and has spent the vast majority of its history playing amateur football. 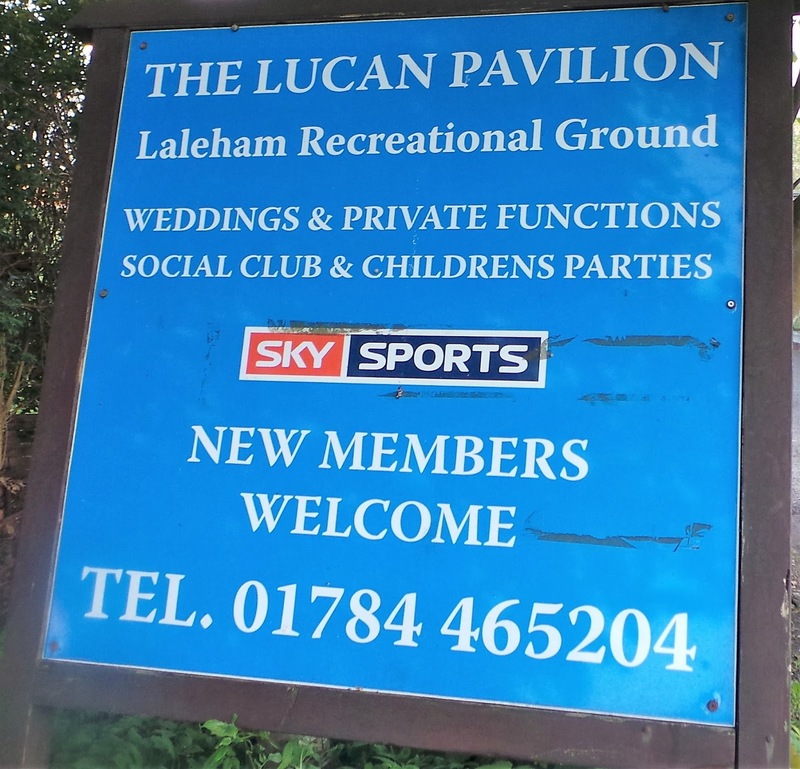 They played in various leagues such as the Hounslow & District, South West Middlesex, Woking League and Surrey County Intermediate League. In 2003/04 they made the step up to semi-professional football, joining the Combined Counties Football League. 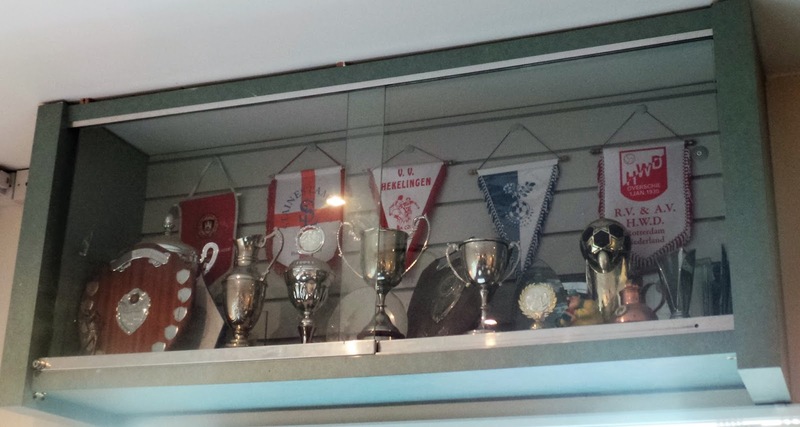 They started out in Division 1 and have finished on the top half in all but two seasons. The most successful seasons came in 2008 and 2009 when they were champions. However, their basic ground was deemed not good enough for the Premier Division, so they were unable to take promotion, the main sticking point being the lack of floodlights. From 2009 until 2015 a ground share was agreed with local side Ashford Town. However, they were unable to replicate their form with the best finish being 4th in 2010. Currently, the team are having their best season in a while, sitting 6th and with a good chance of finishing higher. 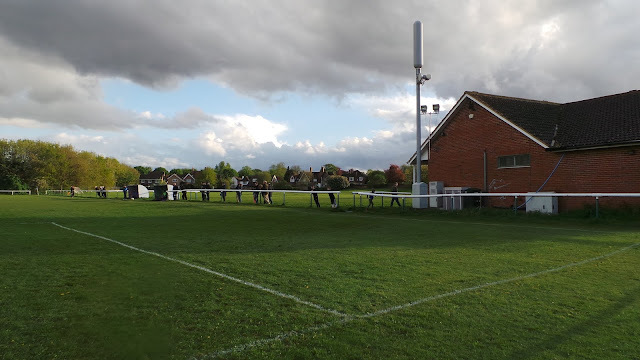 However, they could be demoted to step 7 at the end of the season as the FA are clamping down on any grounds without floodlights during their mass reorganisation of the non-league pyramid. 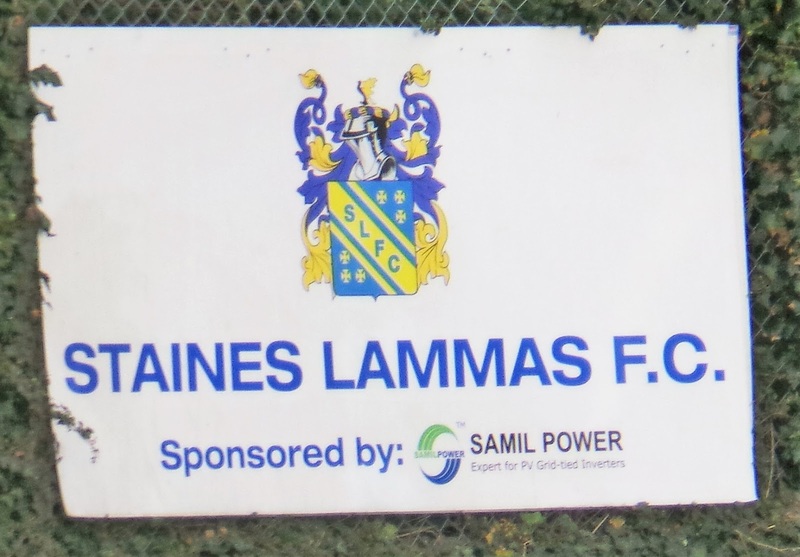 The aforementioned groundshare allowed Staines Lammas to participate in the FA Cup. Their debut season of 2011/12 was the most successful with Clanfield and Harefield United beaten before a narrow 3-2 defeat at Southern Premier side Chesham United. 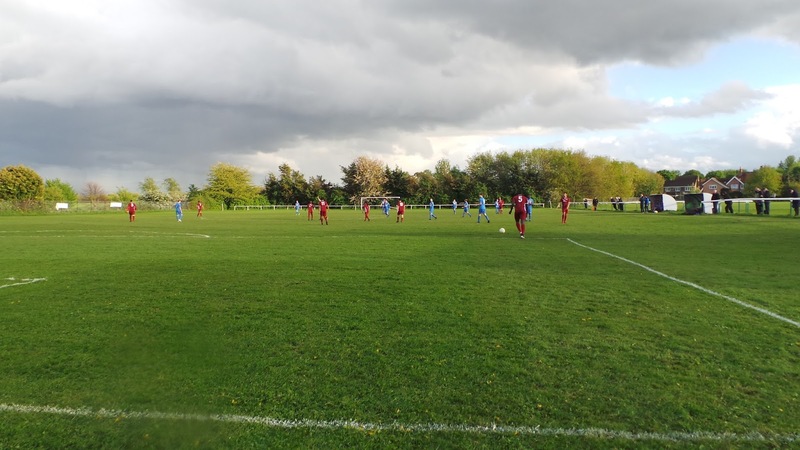 The FA Vase has seen a little less success, the only time they progressed past the first hurdle was in 2013/14 when New College Swindon were beaten before a 4-0 home defeat to South Park. Local cup wins include the Combined Counties Division 1 Cup in 2009 and a cup double in 2013 when they lifted both Middlesex & Surrey Senior Cups. They were also joint holders of the Southern Combination Cup in 2007 along with Merstham after a date for the final could not be agreed. 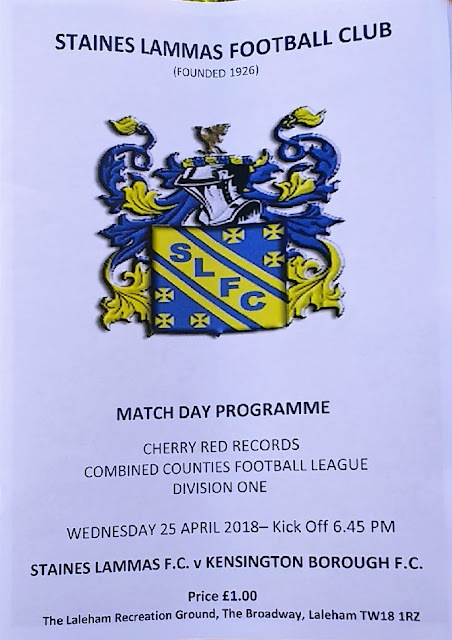 I wasn't initially going to a game on this night, but then my fellow groundhopping pal Ryan spotted that Staines Lammas were at home. It was only a very basic ground, but it was one that I needed to do. It would potentially be one of Staines Lammas last ever games in the Combined Counties League - thanks to the FA. If they have their way, all grounds without floodlights will be banished from step 6, though there is the chance for recourse via an appeal. Hopefully, I'd bring them better luck than I previously had - I'd seen them twice before - once for an 8-1 FA Cup defeat in a game played at Ashford Town and then again for a 2-2 FA Vase draw at Irchester. Though the draw had been an improvement on the previous outing, they were thrown out of the Vase despite a 3-1 win in the replay, for playing an ineligible player. I was still yet to see the visitors Kensington Borough, who were enjoying a steady season in mid-table. The day of the day came and I woke for work at 4.15 am after around 4 hours sleep thanks to the ecer-delayed kick off at my game last night. I felt OK though and got the days work out of the way, finishing at 12. I went straight home and grabbed a nap, though the 4 hours was a little longer than intended. I woke at 4.45 and had a bath before trying to catch up on my blogs. 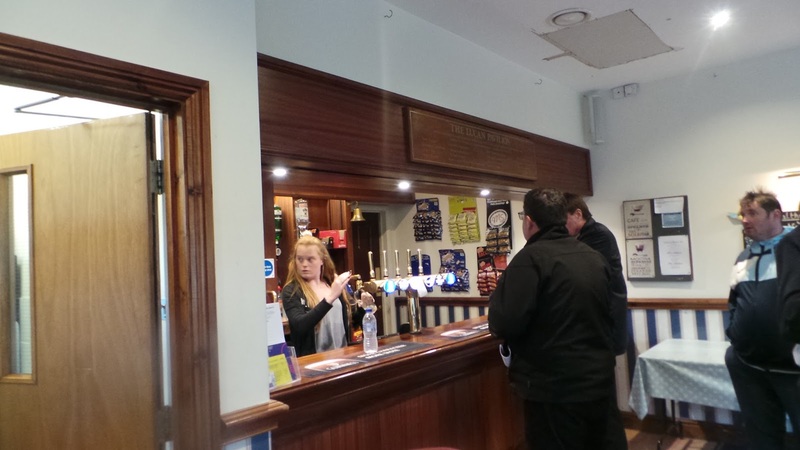 I'd given myself a bit of a busy schedule with games four days in a row and was going to knock Dunstable Town v Gosport Borough on the head tomorrow until someone who read my blog offered me free entry to the game. With it only being 23 miles from home and a decent game on a rubbish night of TV, I decided to accept the kind offer. Due to a miscommunication with my parents, I didn't leave home until just after 6, twenty minutes later than planned. Thankfully it was a good journey over with only minor delays on the M25 and the baffling 'Crooked Billet' roundabout. I got there just on kick off and it was good to meet up with mates and fellow groundhoppers Ryan and his Dad as well as Jason, who goes under the name 'Undercover Hop' on Twitter. I was glad the kick-off was slightly delayed until 6.50 as it meant that I didn't miss any of the game. Timing was tight, which meant I didn't keep up online, but that actually made a pleasant change. 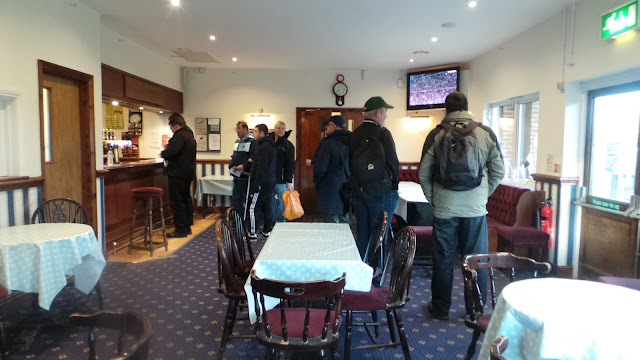 The crowd of 25 which included several hoppers would see a game that started in bright sunshine but ended in chilly, dull conditions. 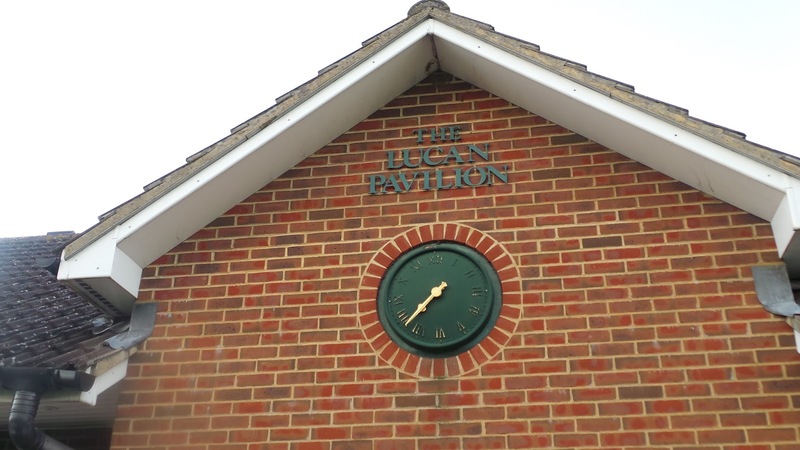 Staines Lammas were the home team and quite a lot higher in the table. 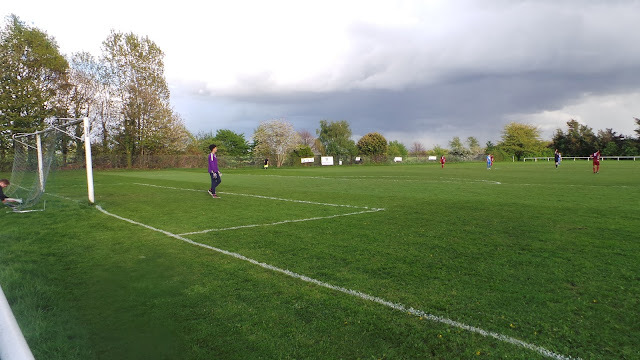 They took the lead after a couple of minutes when a good ball found Ross Nunn who rounded the keeper and slotted into the net through a hole in the net saw it come straight back out again. 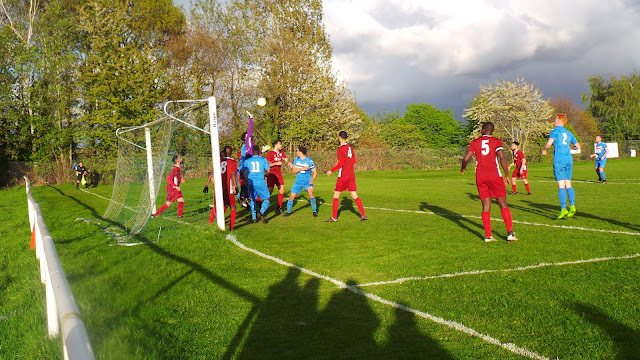 Seven minutes in, the lead was doubled when Tom Hayden's corner was deflected into the net by a Kensington Borough defender. 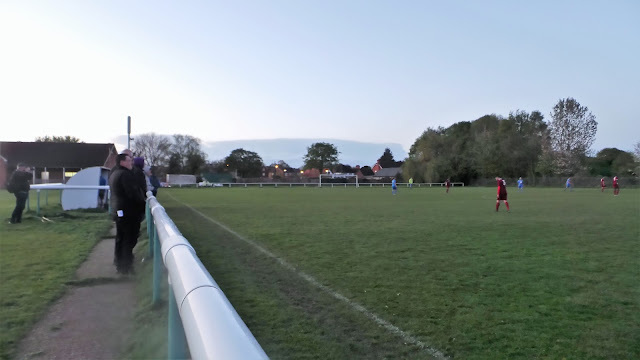 The hosts added a third on 23 minutes, this time the ball was cut back across the six-yard box and Michael Capon put the ball home at the back post. Staines Lammas were running riot and they made it 4-0 on 28 minutes with a goal from Josh Moody who dribbled into the area and finishes past the keeper from around 10 yards. There was a controversial incident five minutes before half-time when Staines Lammas keeper Dawid Gorski was sent off for a 50/50 challenge with a Kensington striker. With the hosts down to ten men, midfielder James Wilson was forced to go in goal and although he guessed correctly the penalty was converted. The visitors failed to take advantage of the extra man and a short back pass on 58 minutes was intercepted by Ross Nunn for the midfielder to get his second of the game to make it 5-1. The hosts completed the scoring on 70 minutes when Mark Goff headed home from a corner. There was still time for chances for both sides, the closest coming when the hosts' stand-in keeper James Wilson made a great save to deny Kensington Borough a consolation goal. 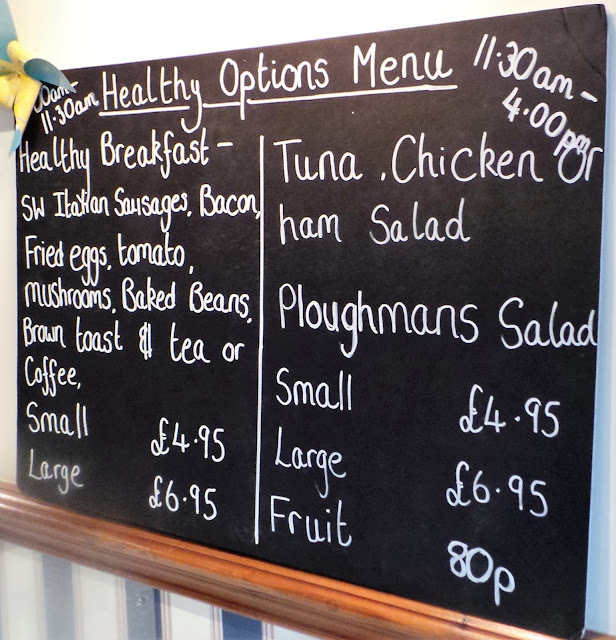 I said goodbye to my fellow hoppers, leaving at 8.40 and getting home half an hour later. The Lucan Recreation Ground is situated in the village of Laleham, not too far from Staines Town FC. 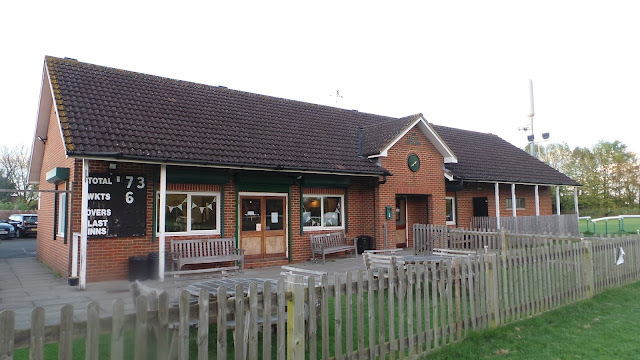 There's a pub opposite and also a smart but compact clubhouse at the ground which also does food. There's just about enough parking. The ground itself is rather basic, railed on three sides and with a small area of hard standing. There's no cover, but it's a nice place to watch football and a friendly club.